I was born in England during WW2. As such, I do not remember the war although I have heard many stories about it from my parents and grandparents. Some of the events after the war still stick in my mind, like the fact my mother cried when she first arrived in Canada and saw a full butcher shop. 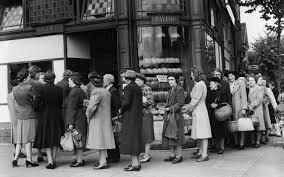 In England, food choices were very limited and many foods were rationed until the early 1950’s. This made for some interesting wartime recipes. The interesting thing is that even with food in short supply, people were healthier than before or after the war particularly the children. There was a conscious effort to feed the children well and they were given extra vitamins and lots of fresh vegetables. Vegetables gardens were started in all the vacant lots and people spent their days off picking rose hips and other wild foods that could be donated to food drives. Because of the food shortages, many new recipes were developed that were very basic, but still had some flavor. The following listing is for one adult (children receive half) per week. This is from the Ministry of Food. This list varied at times, but in general this is a good example. Note many vegetables were available that were grown locally. Here are a couple of wartime recipes, we intend to post more in the near future. Chop the onion, sweat in butter or oil until soft. Add the potato and cook gently for a further 3 minutes. Add the stock and simmer for 10 minutes. Add the chopped lettuce and parsley and continue simmering until all ingredients are completely cooked. Season to taste with salt and pepper. As you can see these wartime recipes are probably not going to become your favorite recipes. But they do give you some ideas of what you can do with very little. More to come in future posts. This entry was posted in Uncategorized and tagged wartime recipes. Bookmark the permalink. Information like that is a treasure. Cos lettuce is a type of lettuce (like Romaine or Iceberg, etc.). So maybe this is better meant to say 2 heads of Cos lettuce? Cos lettuce is another name for romaine, so that recipe would probably be calling for a couple of average size bunches of it. My mother was pregnant during the last year of WWII & craved chocolate, which was very hard to come by. The old man who ran the grocery store in their neighborhood would always set back a chocolate bar for my mother when he received them. As a child of the 50s , that story always amazed me; that there was a time in recent history that not just everything was available on store shelves. My potato soup recipe is very close to this. Made it for years. I don’t add lettuce, but I might try it. I use potatoes (whatever I have), onion (fresh or dehydrated), parsley (fresh or dehydrated), salt, pepper, butter. Have used bacon drippings when butter in short supply. Hubby likes it with cornbread. It is one of our favorites. I also like that it takes just a few minutes to put together and cooks quickly if you dice the potatoes small. Lentils and spinach is very good. To everybody who sent in the information on the cos lettuce, Thank you. I learned something. The BBC has a special multi part documentary titled “Wartime Farm”, it can be viewed on youtube. It is about the U.K. farmer during WWII and is very interesting; well worth the time to watch as it explains what really happened on the home front. When I was a kid growing up, when we had excess Romaine lettuce, more than we could eat as salads and garnishes, when it started to get “old” Mom would chop it up and cook in a steamer in the same manner as spinach or Swiss chard and serve with boiled potatoes, carrots, beets, onions, cabbage, etc. Seasoned with lard if you didn’t have butter, with a bit of salt & pepper. 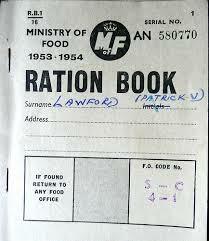 “Poor Man’s Pot.” Healthy and filling if you like wartime British cooking. sugar was rationed but honey was not. my grandfather was able to sell 100s of pounds of honey. if anyone wants to keep bees, they will probably return the investment in the first year in honey and beeswax for candles. if not, most will make money in the second year. join a bee club or find a beekeeper. most will help a nubee.